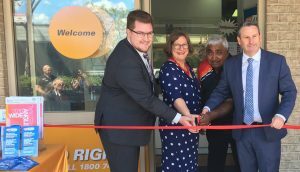 Anything’s Possable: Cr Ben Gilholme, ideas.org.au CEO Diana Palmer, Aboriginal elder Uncle Ivan Wellington and Labor MP Greg Warren cut the ribbon this morning to officially open the head office of the PossAble Advocacy at 300 Queen Street, Campbelltown. Another day and another new service opens its doors in Campbelltown. PossABLE Advocacy’s Campbelltown staff will serve people with disabilities in a large geographic area, including South West Sydney, South East Sydney, Wollongong and the Illawarra and the Southern Highlands. But as ideas.org.au CEO Diana Palmer told the South West Voice in Macarthur, Campbelltown offers a strategic location for a head office. “It really is a perfect location from where to serve both back in towards Sydney and out to regional areas,’’ she said. The head office for ideas.org.au, which was founded in the 1980s, is in Tumut. Establishing PossABLE Advocacy in Campbelltown certainly got the thumb ups from locals at this morning’s official opening. “It’s great to see another service in Campbelltown looking after the rights of people with disabilities,’’ said Greg Warren, the member for Campbelltown. “And this is a critical service, linking people with disabilities and the services available to them,’’ he said. Campbelltown councillor Ben Gilholme, who was representing Mayor George Brticevic, was equally effusive in welcoming PossABLE Advocacy and ideas.org.au to Campbelltown. “Looking after people of disability and advocating for their rights is a noble cause,’’ Cr Gilholme said. The young councillor, who works in the disability service sector, said he was also proud of council’s contribution in this field. “We are on the way to making inclusiveness in Campbelltown our main mission,’’ he said. PossAble Advocacy is a free service that provides individual advocacy to people with disability, their family and carers. Contact PossABLE Advocacy by calling 1800 RIGHTS, emailing advocacy@ideas.org.au or dropping in to the new Campbelltown office, 300 Queen Street, Monday-Friday 9am-5pm.